Halloween is just days away when cute little munchkins run around with scary costumes consuming sugary treats. Dentists love Halloween but moms and dads dread the weeks that follow when your child is off the wall on a sugar high, unless you manage their intake. My folks let me eat chocolate and candy by the bushel maybe because they loved it as well. I let mine indulge but then rationed their candy after the big day. Others I know don’t allow their kids to have any after Halloween and some don’t go out at all. 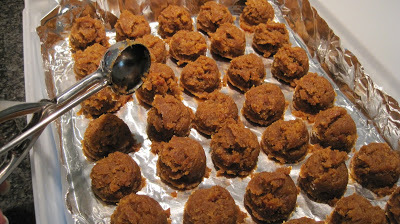 Whatever your family does works well for you however, I just had to share this recipe for Pumpkin Cake Balls & Pops in the event you like to celebrate and indulge. Cake Balls have been around for quite a few years. I’m not certain of the exact date or year but they were introduced by Angie Dudley the creator of Bakerella and her book Cake Pops. However, Angie discovered Cake Balls while attending a party and took it from there. So the mystery is who actually created them? your favorite cake recipe plus icing and blending them together. Make the cake; crumble; make the icing and blend into the cooled and crumbled cake, scoop into balls, then coat with Confectionery Coating and decorate to your hearts content. 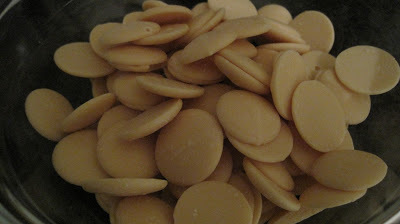 Confectionery Coating is used as a dip for candies. Confectionery, summer coating or candy melts are a blend of sugar, milk powder, hardened vegetable fat and various flavorings. They come in a variety of pastel colors. 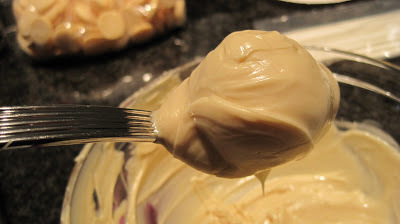 Some have lowfat cocoa powder added, but they do not contain cocoa butter. They taste delicious, but don’t require the careful melting procedures of chocolate which makes cooking with them stressless! The Wilton Company has some handy tips when working with Confectionery Coating that you might find helpful. DON’T FORGET MY VIRTUAL COOKIE SWAP! Whether celebrating a birthday, holiday, bridal shower, baby shower, etc., cake balls are the perfect size. In a world where so many watch what they eat, Cake Balls or Pops take the guilt out of indulging, the same for dessert shots which are also the rage these days. Below is my yummy recipe for Halloween Pumpkin Cake Balls & Cake Pops. With endless decorating possibilities I opted for a simple design. I’m sure you have some decorating ideas up your sleeve though. Please share your ideas with us! In a large bowl, beat the pumpkin, eggs, oil and vanilla until blended. 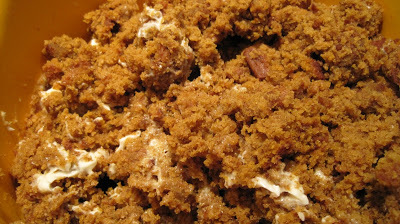 Combine dry ingredients; gradually stir into pumpkin mixture. Pour into a greased 15-in. x 10-in. x 1-in. baking pan. Bake at 350° for 20-25 minutes or until a toothpick inserted near the center comes out clean. Cool in pan on a wire rack. 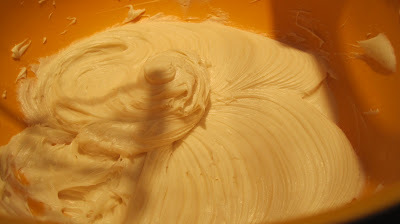 In a small bowl, beat the butter, cream cheese, vanilla, milk and salt until smooth. Gradually add confectioners’ sugar until smooth. Scoop out cake balls with a small ice cream scoop; place on a tray and set in the refrigerator to chill or in the freezer for later. If removing from the freezer allow about 20 minutes for the cake ballls to defrost. Pick up balls and individually roll in the palm of your hand to make a round smooth ball. 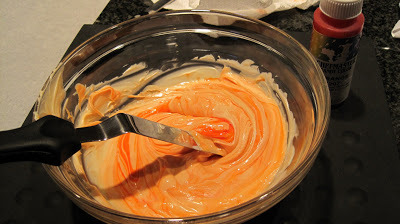 In a microwave safe bowl, heat confectionery coating for 30 seconds, stir, heat for another 30 seconds, stir and then for a final 30 seconds and stir. (Do not microwave all at one time or it will harden) At this point the coating should be smooth. If desired add in Candy Color and if needs to be thinner you can add Paramount Crystals to the already heated coating. Take one cake ball at a time and set into softened coating. Thoroughly coat the ball with a spoon and gently lift out. Tapping the handle of your spoon while the spoon is slightly tilted, knock off excess coating. 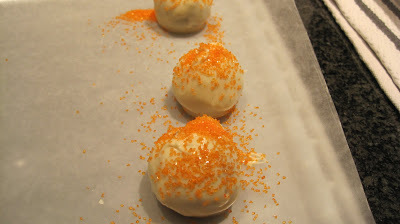 Place coated cake ball onto parchment paper and decorate as desired while coating is still moist. If making cake pops follow same directions only placing the popsicle stick 1/2 way into the cake ball. 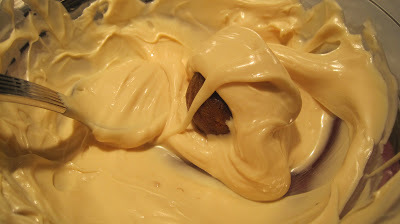 Dip into softened coating and cover with the help of a spoon. Remove with popsicle stick tapping gently to remove excess being sure not to tap too hard or cake ball may fall off. Let dry on parchment or can stick into foam or styrofoam cup. Will last unrefrigerated for up to a week. However, they won’t last that long. Note: If desired you can always make the cake, ice it and cut into squares. It’s great that way as well! Your cake balls sound great. 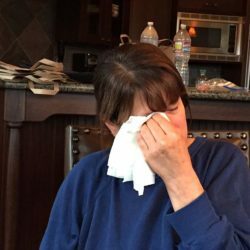 @Lizzy and Christine – thank you! Vicki – these are stunning! The decorations are perfect and your photos are simply stunning! what a GREAT fall treat for kids and adults alike! I have to say – I’ve been behind on this – but I’m now following you on Google Follower. I should have a LONG time ago because I pretty much stalk you anyway! You’re awesome! Thanks for the kind words about my photos. I’m lacking in that department and trying to learn more tricks and find other software that enchances the photos. Haven’t found those yet. As for following me, well guess what, you already did. Look at the board. You’re the first one and the last on that page. But hey, the more the merrier. Thanks for following me, I appreciate it! I follow you as well. @Ann – you know I just checked and I did follow you. I wonder if when you changed your site I was deleted. At any rate, I just added myself back. Vicki, these balls look amazing and speak volumes about your culinary skills, for wich I have deep respect! 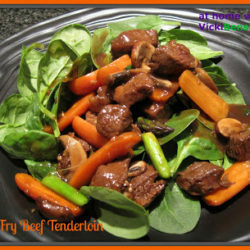 Full of flavours and these look so proffessional!! Thanks for sharing this! Loved this post, as always! Thank you Purabi, you are so sweet. You should try these. They are very easy to make. I usually spread it out over 2-3 days when I prepare them. These are adorable! What a great tutorial you have done. I’ve made cake pops and they are a lot of work but you somehow make them look simple and so….. pretty! I’m sure these won’t last long at all! Your cake pops look beautiful! I have never eaten them before or made them, but they are on my “to make” list. days then it doesn’t seem like much work. @Dulce Dough – they are so easy to make. Best IMO if you spread it out over 2-3 days. 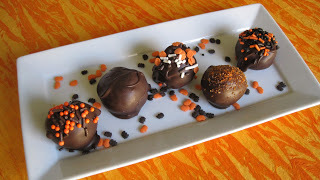 How cute!I love those pumpkin balls with chocolate coating. These look delicious! I love little bits you can just pop in your mouth. Perfect to serve when entertaining and so festive! Love these! @Parsley Sage, Angie’s Recipes and Jennifer – they are so good and yes, perfect for just popping in your mouth. 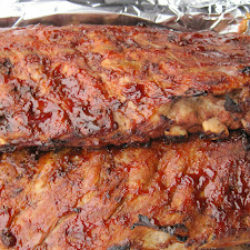 Only problem, even though they are small – popping a lot of them will rack up the calories – but they are SOOOOOO Good! I hope you’ll all try them. These are so perfect you would put everyone out of business lovely color and delicious sounding to make! You’re so sweet Claudia. They’re really quite simple to make especially if you use a box cake mix and ready-made icing. 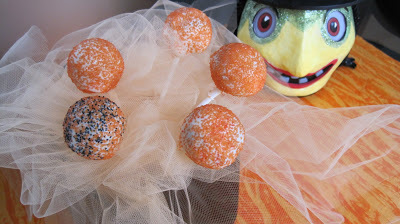 Pumpkin flavored and so festive, your cake balls certainly give Bakerella a run for her money! I’m really bad when it comes to rationing my kids from sugary stuff, probably because I have the biggest sweet tooth in the house ;-). If we celebrated Halloween here, I’d be trick and treating myself – and I’d have the biggest bucket for my sweets…haha. Oh btw, Nigella seeds are onion-tasting black seeds. More commonly called ‘blackseed’. They’re used in a lot of Indian cuisine and in flatbreads. I love the flavor they impart and use plenty in my curries. Try your Asian or spice stores to see whether they stock it. I had no problem with my pumpkin falling apart…maybe because I selected such a small one? 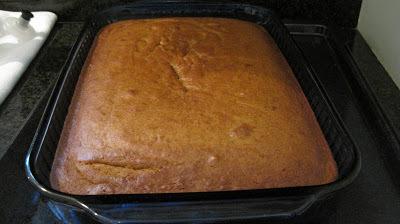 And I just baked it on a parchment lined baking sheet. The final color was so deep and wonderful…I know these will impress your guests. So nice to meet up with you on your beautiful blog/s Vicki! Thank you for taking the time to come visit mine. I’m your newest Google Friend ~ and I look forward to following along. I am longing for a taste of your cake ball pops! These look amazing! I had my first cakeball just last night at a baby shower. It was so good! They also made cookie ones with crushed oreos, and these really cool owl pops–cake pops decorated like owls. So crafty AND tasty! @Foodista – thank you for your nice comments. Bakerella does some amazing things with cake balls. She is very creative. Good to know about the Nigella seeds. I’ll definitely seek them out here. @Lizzy – I made the stuffed pumpkin last night. It was so tasty. My son stopped by and between the 2 of us we had to stop ourselves. It was absolutely delicious. Plan to do the upcoming FFWD. @Mari – thanks for stopping by Mari. I think I’m already following you but just in case I’ll double check. The cake balls are great. Try making them, they’re very easy. @Nami – Bakerella is not the original creator of cake balls and cake pops. She discovered them at a party and then went home and started making them. It appears she took it above and beyond whomever created them. That seems to be a mystery. 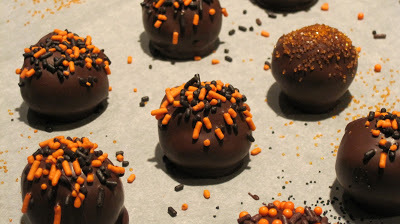 For certain though, Bakerella, make cake balls what they are today. Even if you’re not a baker these are so simple. I make them in stages, usually over 3 days time. Then it’s not so laborious. Your children would have fun helping you. You should try them. @Pick-A-Pepper – thanks for stopping by. Those cake balls sound great. I love the idea of rolling them in crushed oreos if that’s what you’re talking about. The things you can do with cake balls or pops are endless. You should try to make them. They’re just perfect when you need to get that sweet tooth edge off. So festive Vicki! This is one of those things I have been meaning to make and the thought never crosses my mind until it’s too late! But, I am going to make it my mission to make some around the holidays. I just adore cake balls, they are little gems of naughty :). These look so fun and festive. I hope you had a Happy Halloween. I had to turn my lights off and pretend I wasn’t home because I forgot to buy candy LOL! @Heather – Do try them. They are so easy. I would just suggest doing them in stages, it makes it easier. @Heavenly Housewife – they are fun and festive and everyone loves getting a sweet nibble of them. Too bad you forgot your treats. I love all the kiddies coming to my door. We didn’t have too many this year though, it was sad! 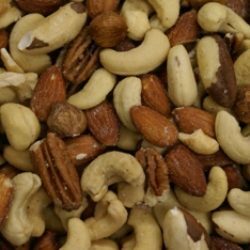 @easyfoodsmith – definitely try them. You might start first with a cake mix for the first time. It will go a bit quicker. Just follow my steps. They’re fun, easy and delicious!